The Kong Genius range of toys can be filled with treats to keep your dog engaged, occupied and out of mischief! They can also be interlocked to make a more difficult puzzle. Kong is a classic brand of dog toys, well known for their indestructible products but please note that this range is purely aimed at average strength chewers. The Kong Genius Leo is named in honour of Leonardo Da Vinci and is designed to stimulate a dog’s curiosity and hold its attention. The Genius range of toys aims to help combat boredom and separation anxiety. 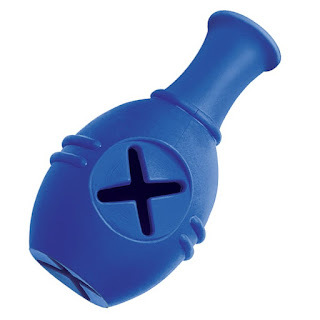 It’s a little odd looking: the toy is shaped like a vase with three separate openings. There is a cross indent on the bottom as well as the side surface. The spout also has a hole/tube inside, which you can use for feeding (small) treats into the toy. You can use the Leo as a treat dispensing toy on its own. It can also be easily connected to other toys in the range - like the Genius Mike - to make a more difficult puzzle. The Kong Genius Mike is named after Michelangelo and it is also designed to stimulate your dog’s curiosity and hold his attention. The best way to describe it would be a colourful ribbed tube with cross-shaped openings at both ends. Our Belgian Shepherds have all established themselves as strong chewers so they were probably not the ideal candidates to test these toys! 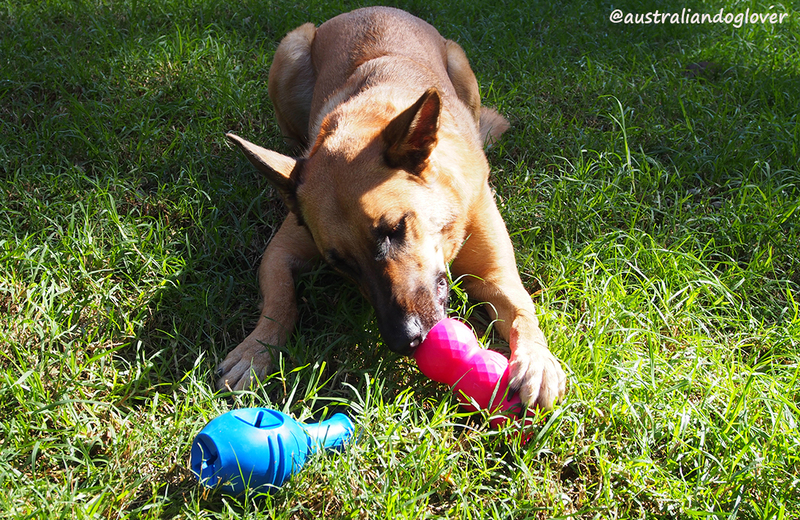 Our Malinois Aramis always seems more interested in chewing on the rubber to solve the challenge permanently rather than getting the treats out so we had to keep a close eye on her to make sure she did not destroy these new toys too quickly! As with all toys, please ensure dogs are always supervised during play and only use them for their intended purpose. Both the Genius Leo and Mike have that classic Kong texture and weight to them and feel like very solid toys. The Mike is made of harder plastic so this would be our suggested pick if you have a dedicated chewer. Having Malinois, our Leo "lost its spout" after just a few days. Using both as treat dispensing toys, I could definitely see the cogs turning in Aramis' head whilst she tried to figure out how to get the food out. However if the kibble you use is too large and does not fall out regularly, your dog will probably lose interest because it requires too much effort. As with similar food dispensing toys, you could block up the holes with cream cheese or peanut butter (ensure it does not contain Xylitol) to keep the kibble/treats in and turn it a more challenging toy. However I felt it would only encourage our dogs to chew the ends and I'd rather let the treats fall out of their own accord. Both the Leo and Mike toys can be easily cleaned: simply put them in your dishwasher and they will look like they've never been touched. From our experience, both the Kong Leo and Mike toys are well thought-out toys but they are best suited to dogs who enjoy solving puzzles or those who have an intense food drive without being strong chewers. Connecting it with another Genius toy is a great feature, but we found quite difficult to push our Leo into the Mike toy. Connecting two Leo (the first one's spout into another's side opening) is a little easier. Without food in them, both the Leo and Mike are still great toys to play fetch with and a good teething chew for an average chewer. 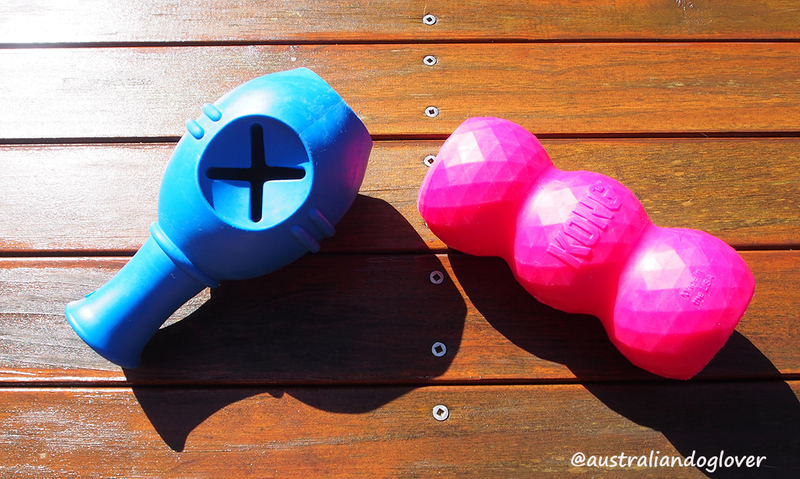 The Kong Genius toys are available in 3 colours: Blue, Orange and Purple and two sizes (Small/Large). RRP: $21.95 (for either toy) from online retailers and pet stores nationally.